Every holiday I make themed treats, and every holiday my poor son (who is gluten free) ends up with gluten free brownies while we eat all the cute goodies. So for Valentines day I am putting my foot down. He will have the cute themed treat! I know we have a couple weeks yet, but I had to do a test run to make sure it tastes ok. LOL So we busted out the great popcorn maker that Santa brought this year. Half the fun is watching it pop the corn! Gluten free or not, this is some seriously addictive good stuff! I will work out a little extra tomorrow to make up for it, because I just can’t resist it! Don’t forget to check out all the great dessert recipes here on A Few Short Cuts! There are some really good ones! 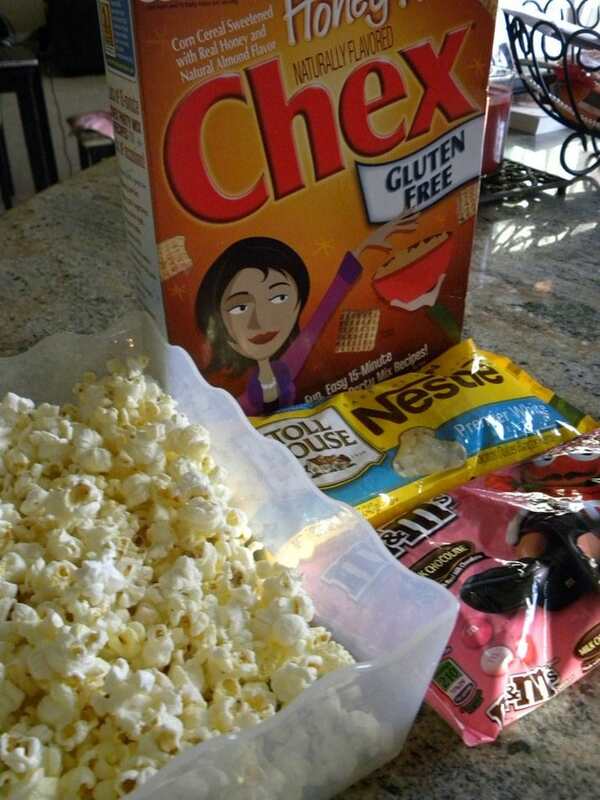 Gather all of the ingredients including the popped corn. You could even add pretzels for the salty contrast, it would be incredible! In a microwave safe bowl melt together 1 bag of white chocolate chips and 2-2 1/2 Tablespoons of vegetable oil. On 50% for 1 minute, stirring every 30 seconds until it is smooth. 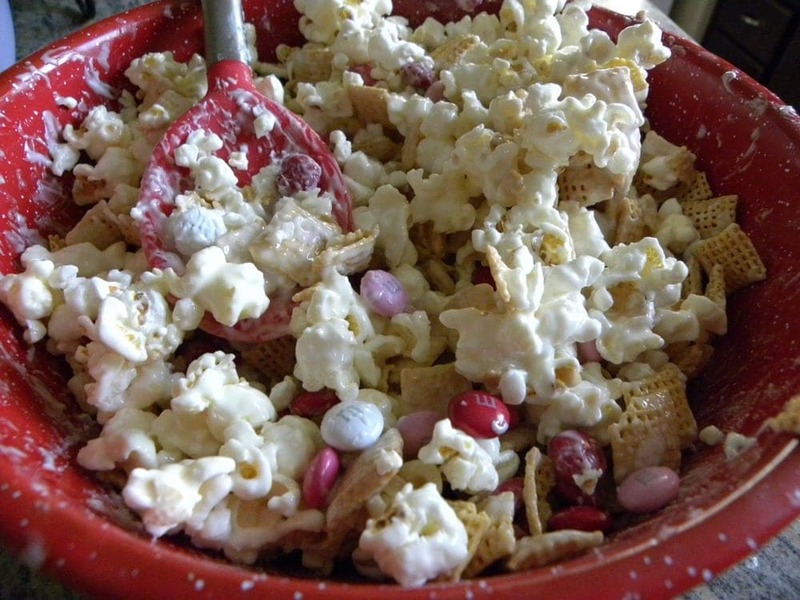 Poor the melted chocolate over the popcorn and cereal. Stir to coat. Then sprinkle in the M&Ms and stir. 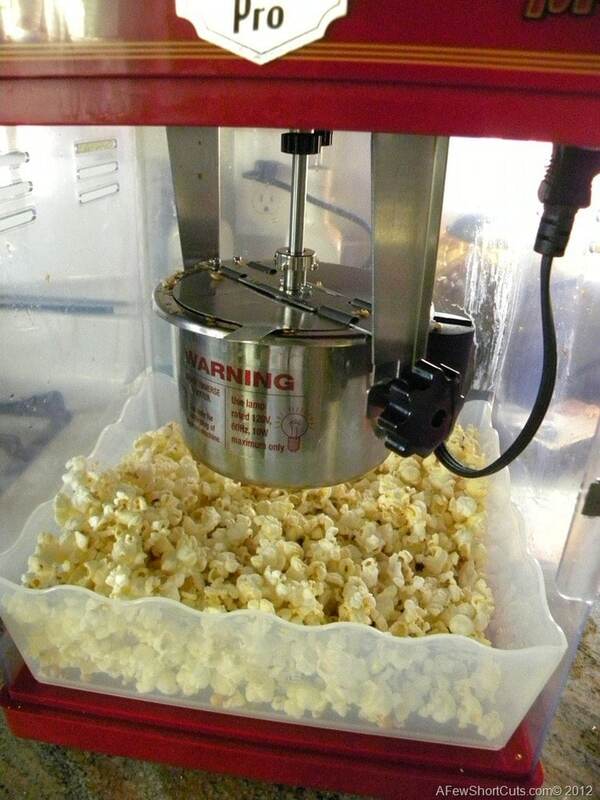 Allow popcorn to cool and set. Serve! Place in cute little cellophane bags for adorable Valentines Gifts! 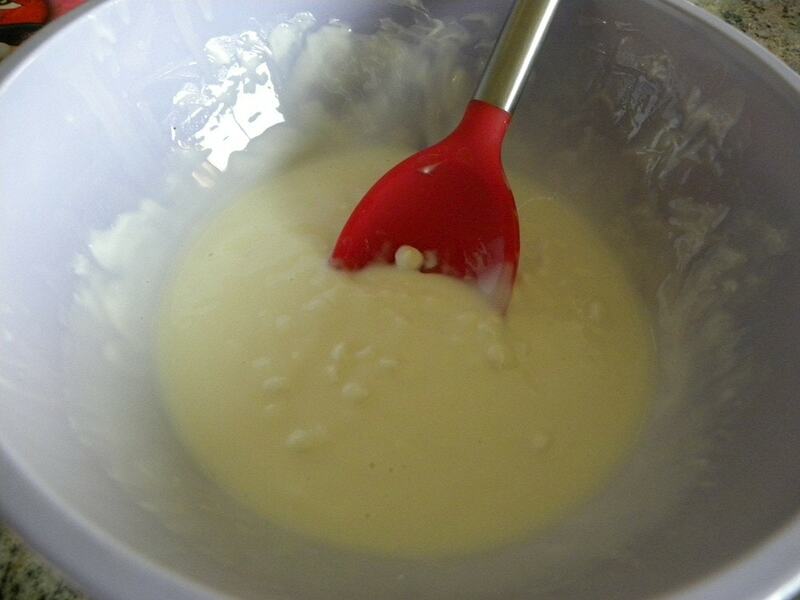 In a microwave safe bowl melt together 1 bag of white chocolate chips and 2-2 1/2 Tablespoons of vegetable oil. On 50% for 1 minute, stirring every 30 seconds until it looks like the picture above. I LOVE this! My son is autistic and we are trying some Gluten free things, so this is great! Thanks! Can I use the regular chocolate chips? Yes you can. I just chose white chocolate to get that valentines look 🙂 You can also add sprinkles, pretzels, whatever you want to make it your own mix. It is super! My kids are drooling over this recipe! Unfortunately, my daughter has a corn allergy, but the M&M’s are allowed so she will get those and the twins can dig into the good stuff! I found out about my celiac sprue about a year ago and LOVE any ideas for fun tasty gluten free snacks! I alway share with my 6 yr old nephew who is in the same boat! These was a huge hit when I made it for my son’s daycare teachers. They were all asking me for recipe. Also, I used Almond Bark instead of the white chocolate, already had it on hand. If you us that instead you need to omit the oil, it is not needed when you use almond bark. Thanks for the great recipe!